You finish your morning coffee as you pull off the 401 at Cambridge, Ontario to arrive at the LEED®-certified, corporate headquarters of the first Canadian-owned reinsurer in the country. You spend your day working with a small, professional team, building relationships with our valued partners, helping to empower and advance the mutual insurance community and providing our members with unique value and expertise. As you work, you take pride in being part of a Canadian leader in agricultural-based reinsurance solutions. 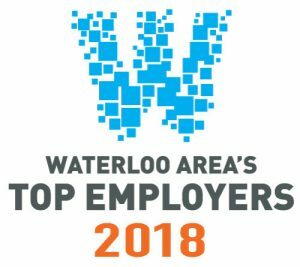 We are honoured to be recognized as one of Waterloo Area’s Top Employers for 2018. Before you leave for home, you visit the fully equipped, on-site fitness facility for a quick workout or take a walk through the scenic wetlands surrounding the office. You may also want to participate in some of our programs to support the community and the environment. In addition to the balanced and professional working environment at Farm Mutual Re, you will enjoy a competitive salary. You will also be rewarded with employer-paid benefits, a retirement plan and more. We even have a scholarship program for children of employees. It’s no coincidence that Farm Mutual Re has such a high employee retention rate. Consider the career opportunities available at Farm Mutual Re.